We’d love your help. 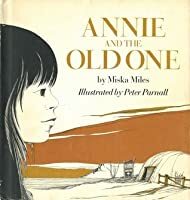 Let us know what’s wrong with this preview of Annie and the Old One by Miska Miles. To ask other readers questions about Annie and the Old One, please sign up. A quiet and reflective book about a young girl coming to terms with her grandmother's approaching death. The illustrations are also quiet but very lovely. Annie rebels against nature and tries to prevent time from passing. This does not work as well as she hoped it would, and her grandmother intervenes. Very warm and loving and pretty realistic. Raise your hand if children books makes you cry? Miles is not Navajo. In my opinion she has no business telling this story and quite frankly this book should not have won a Newberry medal. It has the look and feel of most of the 1970s pseudo indigenous children’s books and it’s just plainly inauthentic. Navajo stories need to be told by Navajo people. Simple. A beautiful book about a child processing grief of the death of her grandmother. Loved this one. I do not know why this book got the Newbery Honor. I was not the least bit impressed with it. The story had elements of greatness, but I just couldn't get into it. I was also a little dismayed with how things turned out in the end, I didn't want to accept it as easily as the little girl did. The illustrations were okay, but I would have liked something with more color. I read this because it was another picture book that had won the Newbery award, like Last Stop on Market Street. It was an okay book, but one in which may not be the most accurate. Annie is a young Navajo girl who lives with her mother, father, and grandmother. Grandmother announces one day that she will be rejoining Mother Earth as soon as she finishes weaving her Navajo rug. Annie, distraught at the impending reality of life without Grandmother, begins to sabotage Grandmother's rug, hoping to delay inevitable. Grandmother takes Annie aside and lovingly explains that Annie must not try to stop time. She must respect Mother Earth and allow Grandmother to go peacefully. Annie, reluctantly, decides to learn to weave and helps Grandmother and mother finish the rug. After Grandmother's death Annie takes comfort in the rug and the warmth and reminders it provides. A lovely story about accepting death. Thoughtful, astute prose gently and truthfully portrays the feelings of anger, denial, and sadness that often accompany the pending death of a loved one. This book is respectfully written and the analogy drawn between Grandmother's time left and the finishing of the rug makes the passage of time and the idea of death more tangible for children. The book is also a respectful portrayal of the Navajo culture and does not seem to perpetuate any negative stereotypes. This book would be a great read aloud in Social Studies when learning about Native American cultures. It could also be a good book to use if a student, or group of students, are dealing with a sick or dying relative. I loved Everybody Needs a Rock so much that I went down a whole list of books with illustrations by Peter Parnall to see which ones we had at my bookstore. Annie and the Old One is a much wordier book than Everybody Needs a Rock, and Parnall's illustrations unfortunately fail to mesh as perfectly with the text. Byrd Baylor's sparse, poetic writing and Parnall's minimalist, experimental approach to Everybody Needs a Rock made the book really special for me. Annie and the Old One is more conventio I loved Everybody Needs a Rock so much that I went down a whole list of books with illustrations by Peter Parnall to see which ones we had at my bookstore. 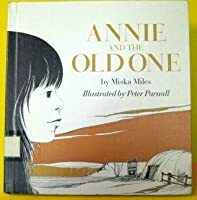 Annie and the Old One is a much wordier book than Everybody Needs a Rock, and Parnall's illustrations unfortunately fail to mesh as perfectly with the text. Byrd Baylor's sparse, poetic writing and Parnall's minimalist, experimental approach to Everybody Needs a Rock made the book really special for me. Annie and the Old One is more conventional, but Parnall does find a few opportunities to be impactful, mainly with great, imposing, circular shapes. This is a touching story about the relationship between a Navajo girl and her grandmother. This book deserves its Newbery honor, and would be a resource to discuss death with children. This would be a great book to use for character traits too. I wasn't very impressed with the illustrations though, they are mostly back and white with a little bit of yellow and brown. "My children, when the new rug is taken from the loom, I will go to Mother Earth." Annie tries everything to distract her mother from weaving so that her mother won't finish the rug she is working on. Finally, she begins to undo the work her mother has done for the day until her grandmother sees what she is doing. "My granddaughter ... you have tried to hold back time. This can not be done." The author use his mellow fine words painted a beautiful story about how a little girl's comprehension about the death where the story happened in the the Hogan set in the desert. An beautiful story with love and time lapse and the nature. Newbery Challenge 113/512. A beautiful longer picture book about a Native American girl coming to grips with the end of her grandmother’s life. Beautifully represents Native American culture and philosophy while gently discussing the circle of life. Recommend. A good story for older kids (it’s longer) about people dying of old age. This review has been hidden because it contains spoilers. To view it, click here. I think it is a good way to introduce the ideas of death and how to deal with the hardships that come when a loved one dies. A tale of a native American girl and her mother. Something about this books is just odd and unappealing. This review has been hidden because it contains spoilers. To view it, click here. I feel very sorry to give this lovely little book a place on the "too much message, not enough story" shelf, but I just had to. Annie is a Navajo girl about ten years old who lives with her parents and grandmother in a traditional hogan, where they raise sheep, grow corn, make silver jewelry and weave rugs and blankets to sell. The desert setting described is both desolate and beautiful, and the prose itself matches it, sparse yet powerfully tender. Annie's grandmother, the Old One, is greatly lov I feel very sorry to give this lovely little book a place on the "too much message, not enough story" shelf, but I just had to. Annie's grandmother, the Old One, is greatly loved and respected by her family, not least by Annie, who loves to listen to the Old One's stories of times long past. One night, the Old One gathers the family and tells them that once the rug Annie's mother is weaving is finished and removed from the loom, "I will go to Mother Earth." She asks each family member to choose a gift that she will leave them. Annie chooses the Old One's weaving stick, but her heart is broken; she knows what her grandmother means, and she knows that it will come to pass, but she is not ready to let go. Annie contrives to delay the completion of the rug, first by playing a prank on her teacher at school. She hopes the teacher will be so angry that Annie's parents will have to come to school and her mother won't have time to weave. But the prank is harmless and humorous, and the teacher is not even upset. Annie next gets up very early in the morning and lets the sheep out of their night pen, hoping that her parents will have to search all day for them, thus losing another day of weaving. But the sheep don't go far, and Annie desperately begins to unravel the rug at night. On the third night, the Old One, who never misses a trick, catches Annie pulling out the threads and understands why she is doing it. The Old One compassionately but firmly explains to Annie that time moves on and can't be held back, just as the sun must rise and set each day, and that, like the sun, she and Annie and everything in the world come from the earth and someday must return to it. Annie is comforted by this explanation and by the Old One's peaceful acceptance of the inevitability of death, and later that day she decides that she is ready to learn to weave, thus taking her first steps toward adulthood. I really really appreciate this book. The story addresses Annie a young girl who really loves her grandmother dearly. The situation of her grandmother passing away comes to light and is expressed to happen once the weaving of a rug is completed. This leaves Annie incredibly distressed. She starts to take it upon herself to prevent that rug from getting finished. Annie starts doing things like letting sheep out of a pen just so she can disrupt the rug from getting done. Eventually her grandmother I really really appreciate this book. The story addresses Annie a young girl who really loves her grandmother dearly. The situation of her grandmother passing away comes to light and is expressed to happen once the weaving of a rug is completed. This leaves Annie incredibly distressed. She starts to take it upon herself to prevent that rug from getting finished. Annie starts doing things like letting sheep out of a pen just so she can disrupt the rug from getting done. Eventually her grandmother passionately speaks to her about the situation and Annie comes to very great understandings. An old wise Navajo woman explains to her family that when her daughter is finished weaving the blanket on her loom she will "go to Mother Earth." Annie is close with her grandmother and is distraught upon hearing of her imminent death. Annie thinks she can prolong the Old One's life by slowing down the weaving process. Delay antics ensue with Annie at the helm. Annie releases the sheep and misbehaves at school in attempts to get her Mom away from the loom. The Old One even catches Annie unraveli An old wise Navajo woman explains to her family that when her daughter is finished weaving the blanket on her loom she will "go to Mother Earth." Annie is close with her grandmother and is distraught upon hearing of her imminent death. Annie thinks she can prolong the Old One's life by slowing down the weaving process. Delay antics ensue with Annie at the helm. Annie releases the sheep and misbehaves at school in attempts to get her Mom away from the loom. The Old One even catches Annie unraveling the blanket in the dark of the night. The next morning they take a walk and Old One explains to Annie that death is a natural part of life that cannot be undone. At last accepting fate and it's relationship with the Earth, Annie is ready to learn how to weave. Summary: Annie lives with father, mother, and grandmother. She and her grandmother are very close. One day, Annie's grandma says that once the rug is completed, she will return to Mother Nature. Annie is afraid and doesn't want her grandmother to die. She tries to cause trouble which will stop the rug from being finished. When her attempts fail, Annie begins to take apart the rug. Her grandmother catches on and explains that Annie cannot stop her from dying. Annie understands and accepts her gra Summary: Annie lives with father, mother, and grandmother. She and her grandmother are very close. One day, Annie's grandma says that once the rug is completed, she will return to Mother Nature. Annie is afraid and doesn't want her grandmother to die. She tries to cause trouble which will stop the rug from being finished. When her attempts fail, Annie begins to take apart the rug. Her grandmother catches on and explains that Annie cannot stop her from dying. Annie understands and accepts her grandmother's death by learning to weave. 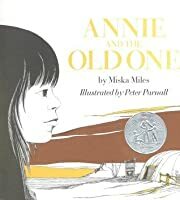 Annie and the Old One, written by Miska Miles and illustrated by Peter Parnall, is a Newbery Honor Book. In this book, Annie learns that her grandmother will die soon. Her grandmother tells everybody that when the woven rug is finish, it will be her time to go. Therefore, Annie does everything she can to stop the rug from getting finished. When her grandmother realizes that this is what she is doing, she takes her aside and explains to her that there is nothing she can do to stop time. 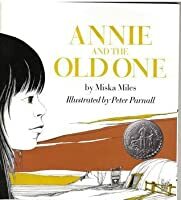 Annie com Annie and the Old One, written by Miska Miles and illustrated by Peter Parnall, is a Newbery Honor Book. In this book, Annie learns that her grandmother will die soon. Her grandmother tells everybody that when the woven rug is finish, it will be her time to go. Therefore, Annie does everything she can to stop the rug from getting finished. When her grandmother realizes that this is what she is doing, she takes her aside and explains to her that there is nothing she can do to stop time. Annie comes to understand and accept this fact. In the end, she wants to learn how to weave, just like her mother and grandmother, with the stick her grandmother gave her. Annie is a young Navajo girl.she lives in the desert with her family members. : her daddy,mommy,& her grandmother.when her mother,father,& Annie find out that when the rug is finished her grandmother must die,& go into mother Earth to rest.Annie does bad in school so her mother nor grandmother cannot' finish weaving the rug.The things that Annie does is,to be bad in school,open the gate so the sheep can run off,& she pulls off some of the weaving strings.The bad things she Does is Annie is a young Navajo girl.she lives in the desert with her family members. : her daddy,mommy,& her grandmother.when her mother,father,& Annie find out that when the rug is finished her grandmother must die,& go into mother Earth to rest.Annie does bad in school so her mother nor grandmother cannot' finish weaving the rug.The things that Annie does is,to be bad in school,open the gate so the sheep can run off,& she pulls off some of the weaving strings.The bad things she Does is hiding the teachers shoe,not listening while the teacher asks questions,and I think that's it.Annie opens the gate so the sheep can run off because then her parents would be searching all day.Annie pulls of the weaving strings so there wouldn't be enough strings to finish the rug. Topics & Themes: Dealing with grandmother's death. The elderly. Family. Navajo culture. Environment. Time. Social: Navajo Indian culture. Acceptance of death of a relative. Respect for the elderly. Literary Elements: Symbolism of death compared to the earth “the sun rose but it also set” “The cactus did not bloom forever. Petals dried and fell to earth”. Time shown in the rug's progress. Dessert setting. Imagery. Annie character working through the stages of grief. I was surprised to learn this was a Newbery Honor book, I expected it to be a Caldecott book because of the size. The illustrations are on every page. They are predominantly black and white with spots of brown to add dimension. The story follows Navajo girl, Annie. She is extremely close with her grandmother and the book shows her coming to terms with the fact her grandmother will die soon. The story clearly depicts Native American cultures and beliefs, yet is accessible to readers that are not f I was surprised to learn this was a Newbery Honor book, I expected it to be a Caldecott book because of the size. The illustrations are on every page. They are predominantly black and white with spots of brown to add dimension. The story follows Navajo girl, Annie. She is extremely close with her grandmother and the book shows her coming to terms with the fact her grandmother will die soon. The story clearly depicts Native American cultures and beliefs, yet is accessible to readers that are not familiar with this. Readers can understand not wanting a loved one to die and trying to prevent that in any way possible. Good story. This 1972 Newbery honor was yet another Newbery that deals wisely, astutely and beautifully with a difficult subject. Young, Navajo Indian child, Annie loves her grandmother with all her heart. When her grandmother tells her that she will pass away when the last thread is woven on a rug that Annie's mother is weaving, Annie results to extreme measures to ensure the rug is not finished. Like so many of us, the inevitability of death is a difficult concept. Loss, grief, fear and pain are emotions we This 1972 Newbery honor was yet another Newbery that deals wisely, astutely and beautifully with a difficult subject. Like so many of us, the inevitability of death is a difficult concept. Loss, grief, fear and pain are emotions we want to avoid. Which one of us wouldn't go to extreme measures if we could save someone we love? In this heart felt tale Annie slowly learns that death is both another cycle. "My granddaughter," the Old One said, "you have tried to hold back time. This cannot be done." ... Thus young Annie learns another important lesson about the cycles of life and the patterns in nature. Award winning American author. Born in Kansas in 1899. Worked as a teacher before becoming a writer. Apparently she became a writer by accident when she inadvertently found herself in a creative writing class at a local college when her own class was full up. Her first book was actually written whilst attending the course! Her career became very successful. One of her books (Annie and the Old One) was made into a film and received a Newbery Honour award. She used her experiences of living on a farm and a Navajo reservation and her many travels, to colour her children's fictional stories, most of which were about animals, nature and different cultures. Quite a few of her novels were horse stories. She also wrote non-fiction, including a number of biographies. She wrote under her own name, as Patricia A. Miles, and also under two other pseudonyms: Miska Miles and Jerry Lane. Her pony books were written under her own name and that of the Miska Miles pseudonym. I don't think she wrote any horse-related stories under her other pen names.